Audiences today are looking for powerful and compelling dance performances that entertain, inspire and move them emotionally. ClancyWorks Dance Company’s one-of-a-kind “architecturally informed partnering” aesthetic and investigations of contemporary issues create the kind of cutting-edge performances that audiences find engaging and deeply satisfying. ClancyWorks Dance Company is available for performances in a wide range of settings and situations. We can mount works from our provocative and award-winning existing repertory, and create new works based on site-specific venues, performance improvisation and new choreography commissions. Please see our descriptions of our repertory as well as our reviews and press from previous performances. We can present current works or restage works form our repertoire. ClancyWorks Dance Company is represented on the artist rosters of Pentacle, Maryland State Arts Council, Arts and Humanities Council of Montgomery County, Virginia Commission for the Arts, and Alternate ROOTS. We pride ourselves on our flexibility to work with large and small organizations, in traditional and nontraditional settings and within a range of budgets. We can also develop customized residencies, workshops and arts in education programs in support of performances. 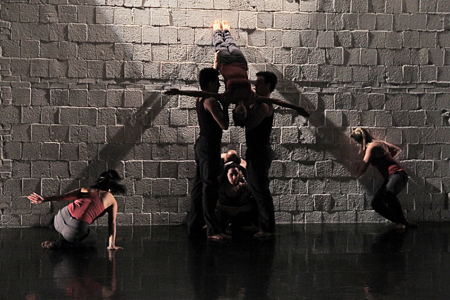 Whether performing in traditional, non-traditional or site-specific venues, in full-length evening works or as part of festivals and showcases, ClancyWorks Dance Company demonstrates a truly unique approach to partnering through architectural concepts as well as insightful explorations of relevant social issues. The company’s outstanding skill lies in its ability to combine physically demanding, powerful movement with the sensitive portrayal of cultural nuances and personal emotions. Adrienne Clancy, Artistic Director of ClancyWorks, has won numerous awards for her choreography and has had her work presented throughout the US and internationally in Colombia, England, Israel, Japan, Mexico, Paraguay, Poland and Russia. In her creative process, she conceives and formulates choreographic structures and challenges for the company members to help solve. The company members offer movement contributions and ideas to help build the work to a larger and more expansive idea. Clancy then works to mold the dance into a cohesive thought, a spiraling process that incorporates and blends the many ideas of the dancers in a manner that highlights their voice, but that is also in keeping with the ClancyWorks aesthetic – a practice we call “architectural partnering,” based on techniques that Clancy has been developing since she began choreographing at the age of 18. For ClancyWorks, the very process of choreographing demonstrates the positive social values of diversity and teamwork, and in the very act of partnering during performance, we manifest the presence of trust and mutual understanding. To discuss booking ClancyWorks Dance Company, please contact us at (301)717-9271 or booking@clancyworks.org. We look forward to working with you to produce excellent artistic productions that shift perceptions through performance!